During the XVth century, the Manu’a empire is vast. It covers a major part of the Pacific Ocean, including Samoa, Fiji, Cook Islands, Futuna and Tuvalu. Fine sailors, Polynesians move from one island to another thanks to their advanced skills of astronomy, winds and sea. At the time, the empire’s capital city is located on Ta’u island. Off the coast of Ta’u, at 15 meters deep, a small coral bommie was born. Nothing could predict that this tiny colony would travel the centuries to become one of the biggest coral structures in the world. During its lifetime, Fale Bommie, like any other coral, has registered every climate event. In 1970, scientists started to read the informations by drilling samples in the limestone skeleton of the reef. It then became possible to analyze changes of temperature, salinity, precipitations… valuable data to further understand the climate evolution across the centuries. The appearance of the warm marine current « El Nino » ( literally translated by « baby Jesus » because it appears shortly after Christmas), were the primary climate data the scientists were looking for on the samples of the Ta’u giant coral. We don’t know exactly why and how El Nino appears, but it systematically result in an important temperature change of the water surface in the Eastern Pacific Ocean, near the equator. One of the most noticeable effects of this warm current is the temporary disappearance of some species of fish, mostly along the coasts of Peru and Chile. Followed by meteorologists since 1920, El Nino’s occurrences have been more frequent the last 30 years. They also seem to be more destructive : during the 1982-1983 appearance, 99% of the Galapagos corals died and half of the coral reefs in Panama bleached. The El Nino that took place between 1997 and 1998 was the most destructive climate event of the XXth century, causing the most important coral bleach ever. In a matter of months, countries like the Maldives have lost more than 90% of their coral colonies. Overall, this particular year, 16% of worldwide coral reefs perished ; in comparison, world coral reefs’ regular death rate is around 1 % per year (source : NOAA). El Nino is not the only phenomenon that worries the scientists. Global warming and most of all oceans acidification are other stress hazards damaging the corals skeletons permanently. 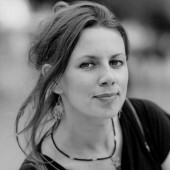 According to coral specialist Janice Lough, member of the Australian Institute of Marine Science, anomalies of coral growth have increased since the beginning of the nineties. Strangely, the samples taken on Fale Bommie don’t show any signs of stress or any modification of its growth. The Ta’u giants have grown regularly and continuously. 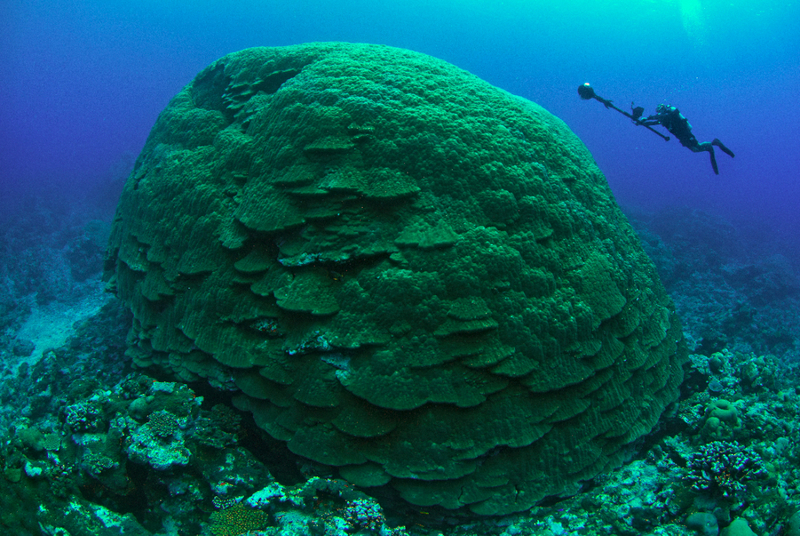 Among many, a question strikes me : Is there anywhere in the world other reefs that are similar to Ta’u’s one ? Thirty kilometers East from Taiwan, the Green Island’s water shelters another wonder of nature: it is called the « Big Mushroom ». Like Fale Bommie, it is a giant colony of Porites lobata. The giant from the Chinese Sea has a circumference of 31 meters, takes root at 20 meters deep and peeks at eight meters under the surface. Slightly smaller than Fale Bommie, scientists believe it is much older. According to them, it would be 1200 years old ! The information has to be confirmed, because no sample has been taken yet. In January 2015, Japan made public a stunning discovery : in the blurred water of the Nagura Bay, divers who wanted to eradicate the crown of thorns starfish came face to face with a giant coral of the Pavona clavus family. 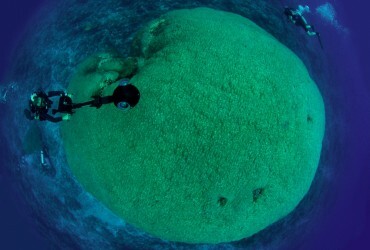 Growing West of Ishigakijima Island, the reef has a circumference of 70 meters and a height of 10 meters! Corals size isn’t necessarily connected to its age. In warm waters, coral tends to grow faster. On the contrary, in cold waters, small size colonies reach record breaking age. Accordingly, off Hawaï’s coast, at more than 450 meters deep, researchers have found a 2742 years old specimen of golden coral, named Gerardia. At the same depth, the scientists have found a black (Leiopathes) coral that was declared 4000 years old ! 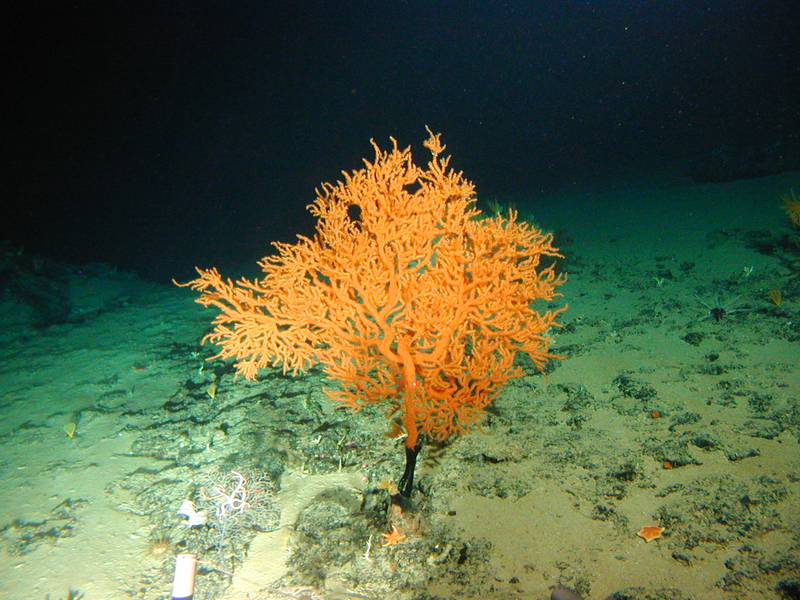 These deep sea corals grow in very cold waters and with no light. 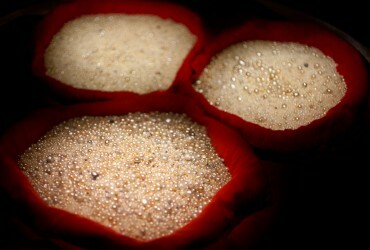 They have an estimate growth rate situated between four and 35 microns per year. To help evaluate the scale of growth, a hair is approximatively 80 microns thick. But among all these underwater elders and giants, what makes the Ta’u colonies unique, is the valley they formed during the last five centuries. A rare proximity between the colonies that scientists aren’t able to explain. One question remains: will the specialists be able to explain it in time ? Because the risk for Ta’u giants to disappear is very real. Other scientists believe that some reefs are able to resist or will adapt to global warming. According to them, genetics can be very surprising. 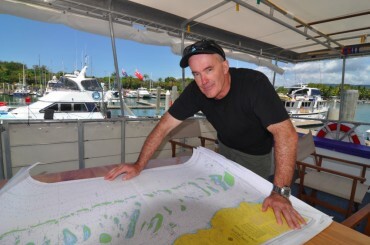 Based in Hawaii, Professor Charles Birkeland, a notorious coral specialist, has studied the Pacific Ocean for more than 40 years and more particularly the US Samoa corals. According to the professor, Ta’u Porites’ genes have evolved more than any other coral in the world. Could this characteristic help them adapt to increasingly faster climate change ? Birkeland is cautious. According to him, climate change and ocean chemical composition are changing faster than in the past. Still, nature is very resourceful. If the big colonies happen to die permanently, younger colonies who survive very high temperatures could become the new population of the valley of the giants. 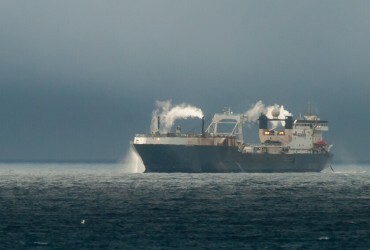 On board of the Bonavista II, while putting our diving equipment away, I take a glimpse at Ofu, the neighboring island. Coral specialist Professor Stephen Palumbi has installed a research lab there, right after it was discovered that Ofu corals were able to withstand water temperatures reaching 34°C. A lethal temperature for most world corals. Strangely, not in Ofu. Would it be possible that « super-corals » have grown in the waters of these islands ? Would it be possible that reefs found the genetic key to survive to global warming? It’s the enigma Steve Palumbi has been trying to solve for years now. The Antarctic krill is the largest biomass on earth. For most of the animals living on the white continent, krill is a key prey item. But for the past five years, new hunters have appeared. A dozen of factory fishing vessels travel to the far side of the planet to quietly capture what could become one day a gold mine. Although Capri and Ischia islands are its closest neighbours, little Procida is an exception. Nested in a small blue corner of the Mediterranean sea near Naples, this beautiful rock could have mimic all the others by living thanks to mass tourism revenue. 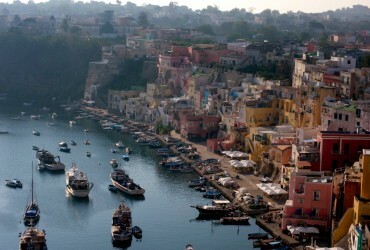 But for Procida, the story is entirely different.